What is Smart Client Data Capture and Why is it So Important? NAAIP will soon be introducing free insurance agents business websites with sales tools such as quoters. The insurance agent website is designed to be the best in the business with the most features to assist agents, all free of cost. NAAIP, in the past, has helped multiples of sales professionals succeed in their chosen industry with various technological wizardries. By joining our network of accredited insurance pros, an agent will not only have a fully functional online business with embedded quote engines, but a whole host of other features. These include adding affiliate companies graphics, social networking, a choice of styles and a business management database (soon to be extended into a complete CRM solution, exclusive to NAAIP). So imagine you have signed up for a free NAAIP insurance agent website and it is attracting visitors. The client clicks for a free quote – and sees that your site provides a real quote engine. The client is prompted to provide their info to receive a customized quote. This simple prompt means that every visitor that requests a quote will convert as a lead in your NAAIP back-office and email. NAAIP sites are designed to ensure that you get the maximum benefit from its services. Agents who sign up for a free agent website will profit. Compare this to paid agent websites such as Norvax and Quotit and there really is no reason to part with your money. Join insurance agents and become a part of the NAAIP family with a free website with embedded Life Insurance, Medicare Supplement and auto quote engines. NAAIP will even host your website for free on the domain name of your choice (e.g. steveinsurance.com instead of naaip.org/steve). All you have to do is purchase a domain name and we will handle the rest! 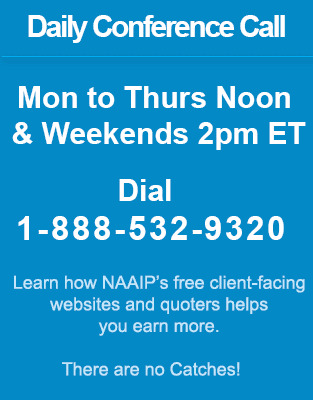 To sign up for a free NAAIP website with embedded quote engines, go to www.naaip.org and register. We are expecting to roll out the product on January 1st. It will be best site in the business and it only takes a minute. NAAIP will impress you! Visit our Monday thru Friday, noon ET conference call to find out more.